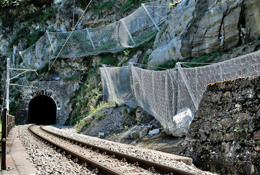 We developed the ROCKFALL-X G and ROCKFALL-X A damping system with the aim of increasing the level of protection and durability that rockfall protection galleries provide. Equipped with cellular glass ballasts or used tires respectively, this system enhances energy absorption capacity while simultaneously reducing the static loading associated with conventional gallery reinforcement solutions. The modular system's low weight reduces the static load on the gallery and facilitates not only easy installation, but also reduces maintenance work after a rockfall incident. The ROCKFALL-X A damping system is also suitable as a temporary protection measure during construction works. Highly sustainable: Both versions of the Rockfall-X damping system use recycled material. Low static loading: Compared with conventional gravel coverage methods, the lighter damping material does not require gallery reinforcement. Interaction between filling and mesh: The impact energy is distributed over a larger area thus activating more material than conventional damping solutions. Adjustable: The height of the ROCKFALL-X system is adaptable to the predicted impact energy, thus simplifying planning and optimizing your budget.